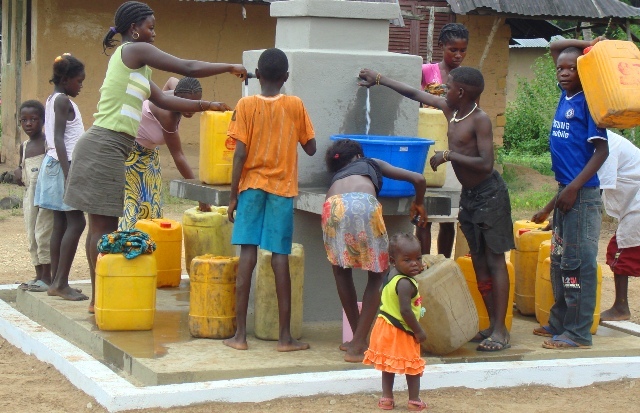 DW, together with the government, developed a policy of community management of water as part of the Angolan Government’s Water for All Program, called “MoGeCA”. MoGeCA promotes an approach involving local communities in the planning, construction and management of water points, as a basic strategy promoting local development. It aims to improve water supply to the population in a way that each actor promotes the sustainability and maintenance of water supplies. Having to walk up to 100 meters to get a bucket of water from a standpost is considered adequate water coverage according to the Angolan Institute of Statistics. Photo courtesy Development Workshop. More that a third of Luandans do not have access to drinking water. 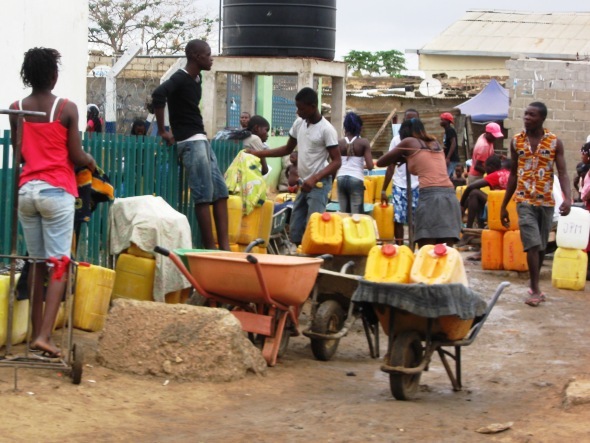 The informal water market in Luanda, pumping river water into water trucks to sell and then re-sell in city bairros, brings in more than 250 million dollars a year, according to a recent study by Development Workshop (DW), a local NGO that has been working in Angola for 34 years. The Angola Field Group invites you to take a closer look at the serious challenges of Community Water Management with DW Director and founder, Allan Cain, Thursday, August 28 at 7:45 PM (please note our new starting time) at the Viking Club. Mr. Cain, an architect, urban planner, and international speaker, will be launching two new videos as part of his presentation. Development Workshop has been working for the last several years with the Ministry of Water and Energy on the development of a new national “Community Water Strategy”. Pumping stations taking water out of the Bengo River to be loaded into waiting water trucks. Everybody is welcome to attend. In close cooperation with the Viking Club, this event is offered free of charge. Beverages and snacks are sold at the Viking Bar which opens at 7:15 PM. Coupons must be purchased. For Sale: Hand woven baskets from the Zambezi Women’s Cooperative as well as books about Angola, and artisanal rock salt from the interior of Quicama National Park. There are various types of water standposts to service communities. Photo courtesy Tako Koning. Development Workshop has been working for the last several years with the Ministry of Water and Energy on the development of a new national “Community Water Strategy” called MoGeCA. 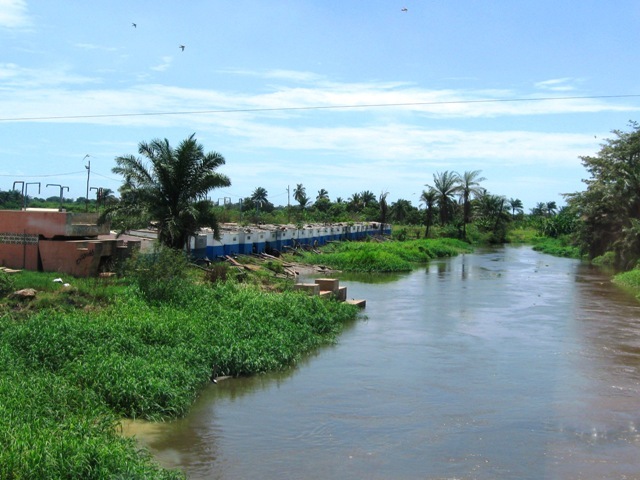 The policy was developed as part of the Angolan Government’s Water for All Program. MoGeCA promotes an approach involving local communities in the planning, construction and management of water points, as a basic strategy promoting local development. Community management is defined here as a form of cooperation between the community and the government – local authorities and the Provincial Directorate of Energy and Water (DPEA) – or local water companies. It aims to improve water supply to the population in a way that each actor promotes the sustainability and maintenance of water supplies. A MOGECA book has been published and printed as result of DW´s more than 30 years working in the water sector, together with government structures. The book is a manual on Community Water Management and has become the Angolan National Policy on sustainable water management. Each book comes with a set of cards to be used at training to explain the target groups how to reach sustainable water and waste management in their communities. Download a copy (in Portuguese) on DW’s website at dw.angonet.org/content/books-dw. Allan Cain is an architect and specialist in project planning, urban development. He has a degree in Environmental Studies, did his graduate studies at the Architectural Association (London, UK) and further specialist studies at Harvard Business School and Bolder, Colorado (in Microfinance and Housing Finance). He has over 35 years of professional experience in developing countries, many of those in conflict and post-conflict Angola. He has worked as a consultant and lead research projects for the World Bank, UN Habitat the European Union and other international organisations. He has lectured at universities in Canada, China, Angola, Norway, USA, South Africa and UK. He is the director of Development Workshop and a member of the boards of several development institutions. His articles and papers have been published widely in international journals. He is co-founder and president of KixiCrédito, Angola’s first non-bank microfinance institution and has pioneered housing micro-finance in Angola and is currently a member of the international board of directors of BPD Water and Sanitation, representing the civil-society sector. DW is engaged as a critical partner in the Angolan Government’s decentralisation programme in the areas of municipal participatory planning and land tenure reform. Their current program in Angola has parallel focuses; on peri-urban communities where the provision of infrastructure, basic services and community economic development remains a serious challenge, and on supporting the rehabilitation of social infrastructure and supporting the processes of settlement and social infrastructure for communities in the central highlands and the provinces of Cabinda and Luanda. With more than three decades of research and practice in Angola, DW has been able to offer lessons for replication and influencing public policy in sectors of land tenure, housing, water supply and poverty reduction.